NEW YORK, NY--(Marketwired - October 13, 2015) - B&H Photo is pleased to share the announcement of the Canon EOS M10 Mirrorless Digital Camera and EF-M 15-45mm f/3.5-6.3 IS STM Lens. The EOS M10 offers users who are looking into Canon’s mirrorless options an entry-level choice with an extremely compact body that holds a large 18MP APS-C CMOS sensor and DIGIC 6 processor. This combination allows for sensitivities of ISO 100-12800, which can be expanded to 25600 for low-light imaging and for fast focus using the Hybrid CMOS AF II system with a continuous shooting rate of 4.6 fps. The M10 also features a 3.0" 1.04M-dot touchscreen LCD for intuitive control over setting, with the ability to tilt upwards 180° for selfies. Alongside high-quality photos, the Canon EOS M10 can record Full HD 1920 x 1080 video at 24p or 30p in the MP4 format and it has manual movie control. For more automatic shooting, the camera also has Creative Assist to allow users to dial-in the look they want. A Self Portrait mode is available, as well, which will smooth skin and brightness, and a built-in flash will help in extremely low-light scenarios. Additionally, the camera has built-in Wi-Fi and is compatible with the CS100 Connect Station. The Canon EOS M10 distinguishes itself from the point-and-shoot with the EF-M lens mount, which enables the use of multiple high-quality lenses for achieving the ideal look during your shoot. This mount is also compatible with EF and EF-S mount lenses normally found on Canon’s DSLRs through the use of an optional adapter. Bundled with the camera is a new EF-M 15-45mm f/3.5-6.3 IS STM lens, which provides an extremely useful 24-72mm equivalent focal-length range. This lens utilizes a lead screw-type stepping motor (STM) that is near silent for use during stills and video. Also, it has a full-time manual focus mode, as well as optical image stabilization good for about 3.5 stops of shutter speed adjustment for low-light handheld shooting. Along with this technology are three aspheric elements, one glass-molded and two precision-molded, that will improve image quality. And, to keep the entire system compact, this lens has a retraction mechanism that shortens the length of the lens when not in use. The Canon EOS M10 is available in two kits, with the 15-45mm lens in black or white or in black with the 15-45mm and 55-200mm lenses. 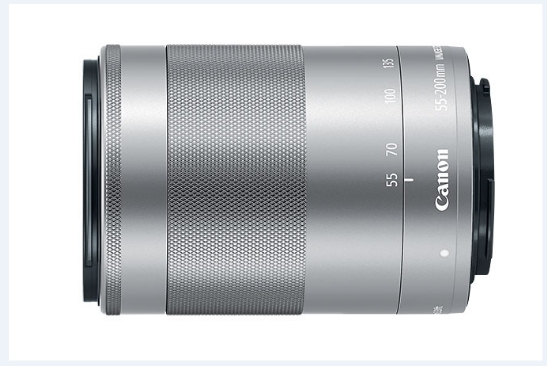 The Canon EF-M 15-45mm lens by itself is available in black or silver and along with this announcement Canon has released the 55-200mm lens in silver. When you’re in Manhattan, take a tour of the B&H Photo SuperStore, located at 420 Ninth Avenue. The expo continues all year round in the camera kiosks at B&H. Featuring the newest cameras, the kiosks are manned by manufacturer representatives, who are there to guide you and demonstrate the latest photographic technology. With hundreds of products on display, the B&H Photo SuperStore is the place to test-drive and compare all the latest photography gear. 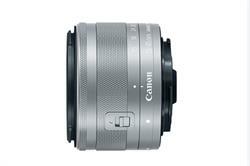 The Canon EOS M10 camera bundles an apt imaging system with intuitive handling and sharing capabilities. 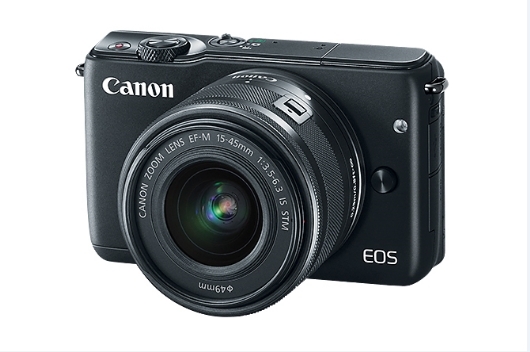 The Canon EOS M10 Mirrorless Digital camera features 18.0MP APS-C CMOS Sensor. The EF-M 55-200mm f/4.5-6.3 IS STM Lens from Canon is an 88-320mm equivalent zoom designed for APS-C-format EOS M-series mirrorless cameras.